New from the Royal Canadian Mint is the 2013 25c Barn Owl Coin, the 12th release in the Birds of Canadian series. This coin features attractive imaginary depicting a Barn Owl against the background of its natural habit. It is composed from cupronickel to a specimen finish, having a weight of 0.5g, a diameter of 35mm and a denomination of 25 cents. 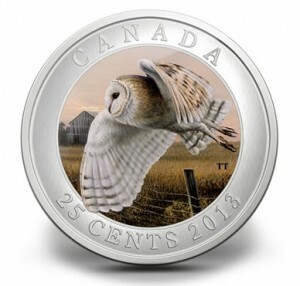 Limited to 17,500 worldwide with past issues consistently selling out, collectors can order the new 2013 25c Canadian Barn Owl Coin directly from the Mint website at mint.ca for $29.95. The designer of this stunning coin is Canadian artist Trevor Tennant. Centered on the reverse is a Barn Owl in sunset flight as if readied to silently swoop on unsuspecting prey. These creatures do not hoot like other owls. They are known for their vocal variety that includes screaming, screeching and hissing. Barn Owls are highly adaptable, often making homes in the cavity of trees, rock faces and abandoned buildings. "The Barn Owl’s appearance is striking. Its body is adorned with beautiful golden back, wing, and tail feathers," describes the Royal Canadian Mint. "It has long legs, sharp talons, and a broad wingspan of up to one metre. Its otherworldly white, disc-shaped face is punctuated by two dark forward-looking eyes and a small beak." A nocturnal carnivore that uses hearing to hunt, artist Trevor Tennant captures the owl above a fenced field of tall grasses. Off in the distance is an abandon barn, perhaps home to the creature. A pinkish sunset is cast against the field on the horizon. 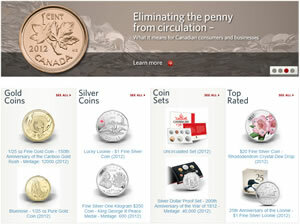 Surrounding the scene are the inscriptions CANADA, 25 CENTS and 2013. Tennant’s initials of TT also appear. The obverse offers Susanna Blunt’s effigy of Queen Elizabeth II. Inscriptions include ELIZABETH II and D G REGINA. Coins are encapsulated and placed within a maroon clamshell case that is lined with black flock and protected by a black sleeve. 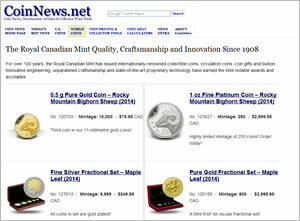 The new coin and other bird-themed coins are found on the Royal Canadian Mint website on this page: http://www.mint.ca/store/buy/birds_coins-cat210016.